The technology in window and door profiles has advanced significantly in recent years which has enabled windows and doors to be painted different colours inside and out. Less than 1o years ago this was a very difficult process that for many windows and doors could only be achieved by having a polyester powder colour on the one side and an applied foil to give a dual colour effect on the other side. Dual colour powder coating is now easy and possible thanks to new technology. Today technology enables all types of windows, doors, curtain walling and aluminium panels to be painted different colours inside and out simply and quickly. This has resulted in far more architectural freedom when choosing colour for windows and doors, given homeowners more choice and expanded the possibility for windows to match the inside and outside of a property in different ways. How are aluminium profiles powder coated in different colours inside and out? It is the thermal break technology that has finally enabled the simple dual colour powder coating of aluminium profiles. A thermal break is vitally important to a window section as it provides the thermal bridge between the inside and outside faces and therefore gives the profile its thermal qualities and prevents cold bridging and condensation on the inside. In previous years the thermal break was referred to as “pour and cut”. This meant that the solid aluminium extrusion was cut and a liquid resin poured in that created the thermal bridge. For powder coating purposes we must remember that the powder coating process itself does not make it possible to paint a complete section two different colours. Therefore with the old pour and cut thermal break dual colours were not possible. Polyamide thermal break technology is what has enabled dual colour powder coating. The thermal break can clearly be seen between the inner and outer aluminium extrusions meaning they can be painted any colour. Pour and Cut thermal breaks have now been replaced by sophisticated polyamide. A high strength material that now separates the inside and outside faces of aluminium profiles that not only gives the aluminium the thermal characteristics it needs but also now enables dual colour like never before. But how is this done? 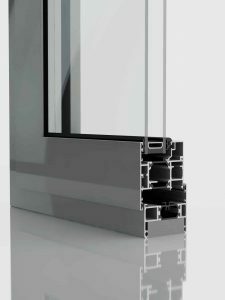 Whereas before a window section such as an outer frame consisted of one solid aluminium extrusion, this has now been replaced by two separate extrusions with the polyamide in between – essentially three parts as opposed to one. 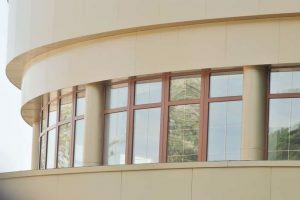 The window frame section now consists of an aluminium outer part, a separate aluminium inner part and the polyamide thermal break in between. Polyamide rolling machines are used to join the three parts together and create the complete extrusion. If we are painting extrusions in one colour it is cost effective to roll the sections in mill finish and these are kept in stock to be painted in a single colour, be it white, grey, black or anything else. When painting the aluminium extrusion two different colour the process is different. For the purposes of this article, let us assume we require a window painted black RAL 9005 externally and white RAL 9910 gloss internally. the two finished extrusions are then rolled onto the polyamide thermal break only once they have been painted to create the finished extrusion. The dual colour paint process does create longer lead times and is more expensive because the processes are longer. Because we need to powder coat the inner and outer parts of the extrusions separately before they are rolled into one dual colour profile, the process is longer and naturally subject to longer lead times. The experienced window company and installer will be aware of this longer process and will therefore make their client aware. However this is generally accepted as they are prepared to wait slightly longer for their desired dual colour choice. It is worth remembering that single colour extrusions can be stripped and recoated should for some reason the wrong colour be chosen. This is not possible with dual colour extrusions as ripping the extrusion away from the polyamide thermal break once rolled renders the section useless. Therefore if you are specifying dual colour you must be sure that you are ordering the right colour, the right combination of what’s needed inside and out. Importantly it may be worth ordering some extra sections for the project in case fabrication errors or other factors mean you need more aluminium and it is better to have extra left over than wait for new sections to be painted. Polyamide thermal break technology is what has enabled the dual colour coating of aluminium. This has now resulted in far more vibrant and individual aluminium windows and doors whether they are installed in the home or in commercial buildings. Article sourced from the company "SUPERIOR PAINT & POWDER COATING"